My sweet friend Caroline hosted a late Mother's Day brunch this past Saturday. It was so much fun! We all were to bring our favorite brunch dish to share. We were also to send her the recipe early so she could compile all of them and give them to us at the brunch. How much fun is that? Well needless to say, I got some new recipes! This cake was so pretty and yummy. Every time I think of pistachio anything, I am reminded of pistachio ice cream from the Spaghetti Factory in Nashville. Have you been there? Have you ever had pistachio ice cream? Most people have never even heard of it, and you can't really find it anywhere either. But it is so good! If you get a chance, try some! 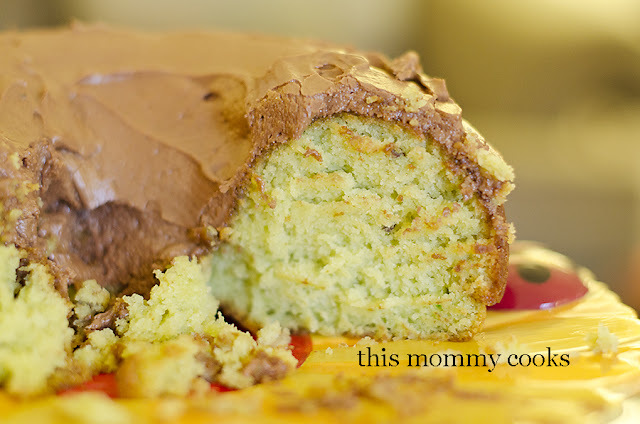 I almost forgot I am sharing a pistachio cake recipe and not ice cream. This was delicious. Enjoy! 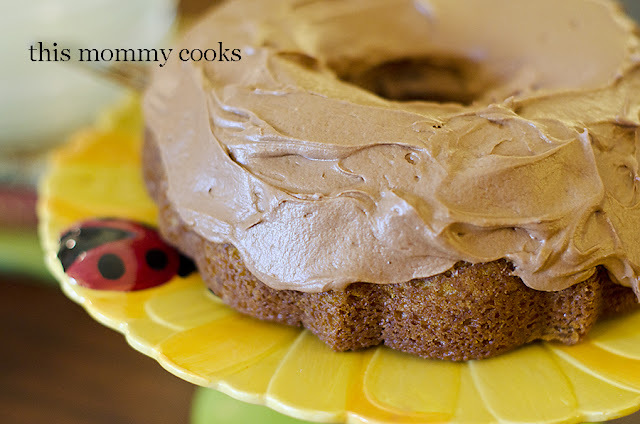 Preheat oven to 350 degrees F. Prepare bundt pan by spraying with nonstick spray. In large mixing bowl, combine all ingredients for cake. Mix well until all ingredients are incorporated. Pour into greased pan. Bake for 45 minutes to 1 hour until toothpick inserted comes out clean. Cool in pan for 5 minutes and then invert on a cooling rack. Keep pan on top of cake if it doesn't slide out easily at first. Let it loosen for 10 minutes or so and then remove pan and allow to completely cool. Combine butter, cocoa, and milk. After combined, add in powdered sugar and mix well. Pour/spread icing over cooled cake.